Labour councillors in Blyth have praised residents for their efforts in opposing the introduction of seafront parking charges, which have now been dropped. There was also frustration at what they saw as an attempt by the Tories to take credit for stopping the charges being introduced, when they believe that it was their efforts to rally the community which won the day. Conservatives Coun Daniel Carr, of Blyth Town Council, and Coun Glen Sanderson, Northumberland County Councils cabinet member for local services. To help fund a £10million investment in parking improvements across Northumberland, the county council proposed introducing or increasing charges in a number of car parks. As part of this, it was suggested that while the first hour would be free, up to three hours’ parking would cost £1.50 and all day would be £3 in three of Blyth’s coastal car parks – Beachway, Mermaid and the Ranch. The proposal did not go down well in the town, with thousands of people signing a petition against the introduction of charges. But, as reported last week, it was revealed last Tuesday (January 15) that Northumberland County Council’s leadership had decided not to push ahead with the proposals in Blyth or several other locations, including Cresswell. The following night, at the Ashington and Blyth Local Area Council meeting in the town’s civic centre, several people in attendance, including a town councillor and a representative of Blyth Battery, praised their Labour and Lib Dem county councillors for their efforts. After the meeting, Coun Eileen Cartie, who was one of the first to raise concerns about the proposals publicly, said: “I was thrilled to find out that the car-parking charges due to be introduced at the Blyth beach car parks have been scrapped. “Residents of the area and local Labour councillors worked hard to share the people of Blyth’s views on the proposals to the current Tory-led council. With petitions being signed by thousands of locals, it seems they have finally found, albeit it a roundabout, way of listening. “I believe introducing car-parking charges to an area like the beach would not only have hurt less fortunate families, but also the businesses and volunteers that work in the area too. Why should the locals have to pay to visit a natural and cherished amenity of Blyth which has been free for decades? “It’s unfortunate the Tory council decided they didn’t want to cooperate with Labour councillors’ concerns initially and, given this was in the best interest of all of Blyth, it would have been more swift and helpful for Tory councillors of the area to have reached out to locals and other councillors of the town from the onset of the proposals. “This is, however, a win for Blyth and the surrounding areas. I will, with the help of the residents, continue to fight and improve the area to the best of my abilities. 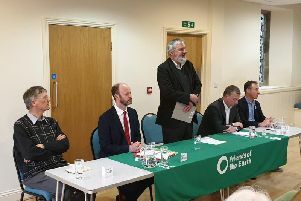 Last week, Coun Glen Sanderson, Northumberland County Council’s cabinet member for local services, said: “I said all the way through that this was a genuine consultation.